If there is any conflict between the words and acts of any member of the hierarchy, even the pope, and the doctrine that the Church has always taught we will remain faithful to the perennial teaching of the Church. Romish leaders who signed the pledge include the President of Associazione Famiglia Domani, Virginia Coda Nunziante, and seven other Italian leaders. Also signing it is Roberto de Mattei of the Lepanto Institute, as well as some American Catholic leaders. The Papists are willing to sign statements pledging their loyalty to Scripture over the Pope, but clarified that they were not willing to leave the Papist faith. Statement swirling around the media today from the signatories took an every stronger stance against the Pope and his blatant social liberalism. These Roman Catholics, of course, are not truly affirming Roman Catholic doctrine when it comes to the authority of the Pope. Papal infallibility was dogmatically proclaimed at the First Vatican Council of 1869, which declares the “Petrine supremacy of the Pope,” whenever the bishop of Rome is speaking ex cathedra – in official capacity as the Pope. Before the First Vatican Council, papal infallibility was largely assumed and suggested as early as the medieval period, but the Pope could theoretically be over-ruled or even disobeyed. But now, the Pope’s interpretation of Romish doctrine is to be seen as supreme and infallible. 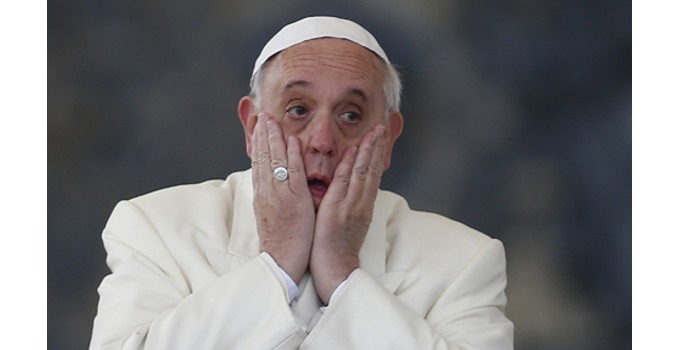 The Pope and the Pope’s church – by dogmatic decree – are “irreformable.” Let that soak in. We pray that our Roman Catholic neighbors will abandon the false religion of Rome altogether and become Christians, trusting in salvation by grace through faith in Christ alone.